Here's a beautiful piece celebrating 50 years of marriage. This gentleman wanted to choose the perfect gift for his wife and wanted the numbers "143" incorporated somehow. We were discussing a few options, when he stopped at a case and said "What about this?" pointing at this beauty. 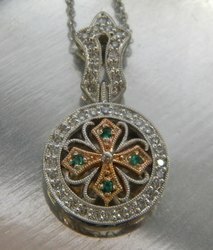 We set 4 emeralds in place of the original pink sapphires making this very vintage styled piece, just a wee bit Irish also. 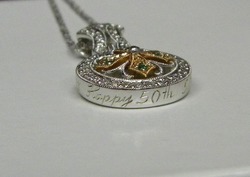 he hand engraving along the side personalized to his specifications and yes, it included "143".